With so many nationally famous sandwiches -- the Yardbird at Slows, the chicken shawarma at Bucharest Grill, the Mudgie at Mudgie's, Green Dot's mystery meats, all of the corned beefs -- it's hard for a new sandwich to "steak" (get it???) its claim to fame in Detroit. 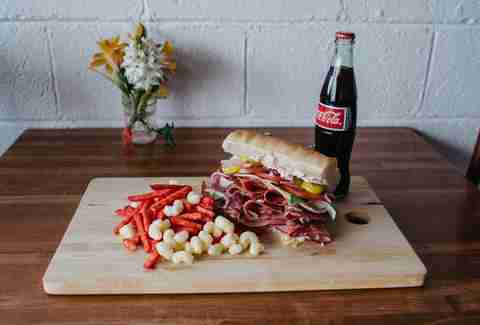 So, we looked specifically at restaurants that opened in the last couple of years for the best of Detroit's new class of sandwiches. 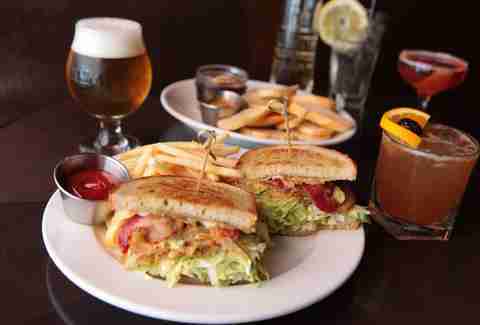 Surely you are familiar with the sandwich classic the BLT -- bacon, lettuce, and tomato. 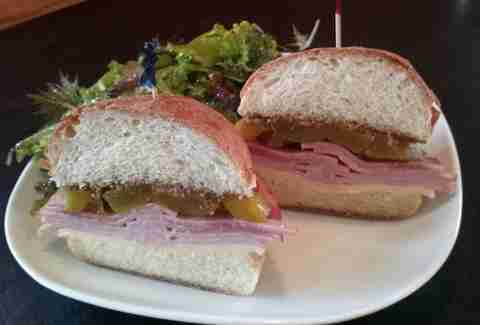 It is the Old Fashioned of sandwiches. 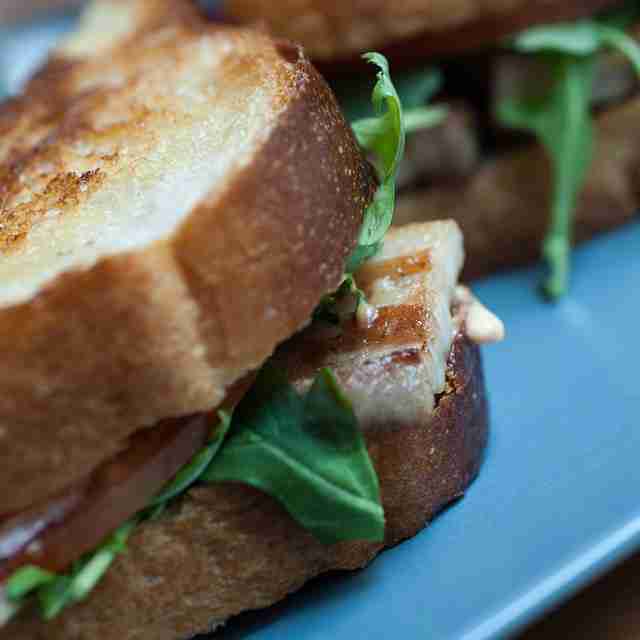 Well, upscale comfort food house of worship Dime Store has stepped it up a notch with the "PBLT" -- crispy pork belly, tomato, arugula, and spicy mayo on white toast. This is definitely not your grandparents' BLT. It is the bacon-infused bourbon Old Fashioned of sandwiches. 2015 James Beard Award semi-finalist Andy Hollyday is killing it over at Selden Standard, and while people probably aren't paying as close attention to the sandwiches on the lunch menu as they are to the exceptional dinner menu, they are doing themselves a disservice: the smoked pastrami sandwich with giardiniera, Gruyère, grilled onion, and mustard aïoli is a true testament to the sandwich arts. Most definitely a twist on a bánh mì that you'll only find at the kind of place that specializes in "farmstead cuisine," this lunch item features slow-roasted pork, crispy pig’s ear, chicken liver paté, pickled vegetables, fresh herbs, and house hot sauce. MORE BÁNH MÌ, PLZ. 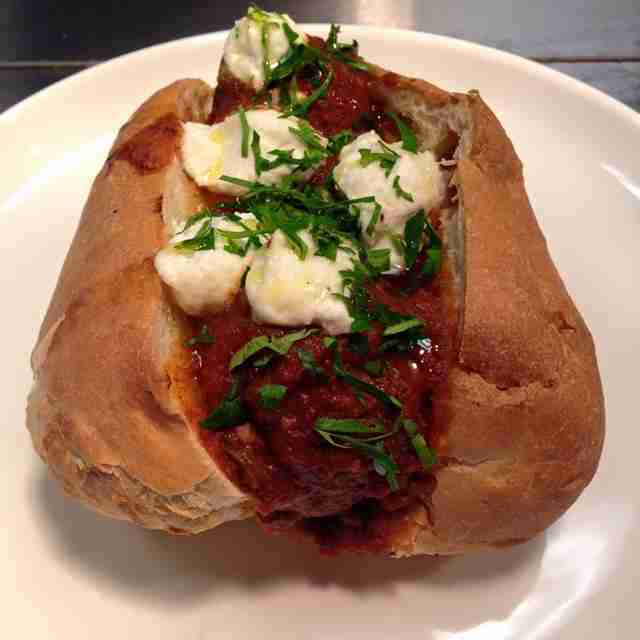 Also worth sticking in your mouth: the Malibu's Meatball with beef/veal/pork franken-meatballs, house-made Calabrian red sauce, and burrata cream on a fresh-baked hoagie. Knife and fork recommended but not required. White shirt definitely NOT recommended either way. It's hard to find a good po' boy this far north of New Orleans, so the fried shrimp po' boy at WaLa is a welcome addition to the local sandwich scene, right down to the spicy mayo. Located at the corner of Washington and Lafayette (hence the name), this tiny little diner deserves a spot in your regular lunch rotation. 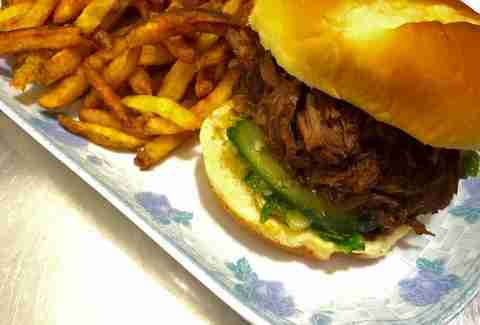 Known for a gritty Detroit rock image and globally inspired flavors at dirt-cheap Hamtramck prices, Rock City Eatery serves up the kind of pulled pork sammy that doesn't give a &$%* with 12-hour roasted pork, house-pickled cucumbers, cilantro, and Thai basil, translating into a pulled pork sandwich completely unlike anything you'll get at a trendy barbecue joint. La Nena's is a new Puerto Rican and Cuban restaurant in Southwest Detroit that serves up a big, meaty, messy Cuban sandwich that is everything a Cuban sandwich should be for everyone who can't afford to fly down to Cuba for the real deal, even though it's legal now. Viva La Nena's! To be clear, there is NOTHING "little" about the Little Italy at Rubbed. Rubbed is the fancy deli you never knew you needed in your life, and the Little Italy -- stuffed with capicola, mortadella, pepperoni, provolone, lettuce, tomato, red onion, banana peppers, and mayo -- is the fancy deli sandwich that will have you asking, "Jimmy who?" AND they deliver, too! Because there is nowhere else in the city of Detroit to get homemade bagels and lox (with cream cheese, capers, and all other appropriate fixings), and while that is indeed a travesty, it's just all the more reason to give DIB your money. There are plenty of great soul food joints in the city and plenty of great fried catfish to be had at all of them, but there is only one vegan soul food restaurant and only one great faux-"catfish" tofu fillet sandwich. 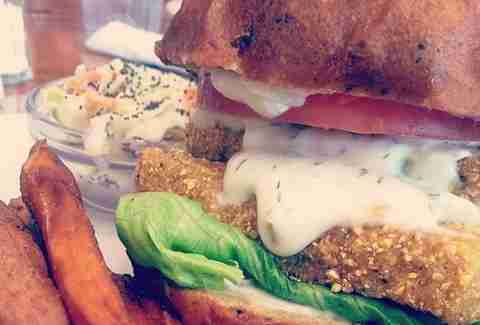 It's at Detroit Vegan Soul and it's made with cornbread-battered tofu served with lettuce, tomato, and vegan tartar sauce on a whole grain bun. You can't believe it's not catfish (or butter, for that matter). Served at one of the fast-dwindling Irish bars of Corktown. Featuring smoked Dearborn pit ham smothered with smoked Gouda, lettuce, and tomato topped with sweet Vidalia onion vinaigrette on fresh-based grilled challah bread, it is the Thor of sandwiches. And a shout out to McShane's Gaelic Club with house-smoked turkey breast too, since we’re here. Made with J&M smoked ham, organic provolone, house-made mustard pickles, maple mustard, and mayo, this is a hearty ploughman's platter between bread that you should order with a side bucket of breakfast poutine (with bacon and a sunny-side up egg) because you can, and therefore you should. So Maccabees makes these things called "potato pancake sandwiches," which use potato pancakes to bookend piles of meat and cheese instead of slices of bread. Which is brilliant. There are several varieties available for lunch, but the brunch version with brisket, cheddar, and over-medium eggs is next-leveling all other breakfast McSandwiches. Another bar, another interpretation of the BLT; this one's got lightly breaded and fried sliced green tomatoes, Applewood-smoked bacon, lettuce, jalapeño crème, and Swiss cheese on toasted rye. Seriously, if you haven't been to Firebird Tavern, you're really missing out. Skip all the other BS in Greektown and head here instead. We've said before that Rose's Fine Food over on East Jefferson is so cute you'll want to pinch its counter, and now Bon Appétit agrees. As that writer notes, "Few diners take the eat local ethos as seriously as Rose’s; fewer still serve a rabbit sandwich on homemade bread." There's really not much more that needs to be added to that, except that said rabbit sandwich features herb-braised rabbit, carrot slaw, and roasted garlic aioli -- and you can get it with a side of homemade doughnuts, and therefore should.